This is a special post; it is special because this is about a compilation of short stories. It is also special because I have also written one of the 21 stories in the compilation. Without much ado I will jump right in and focus on the other stories that are in the book. I will refrain from focusing on the individual stories because they span various genres, styles and timelines. 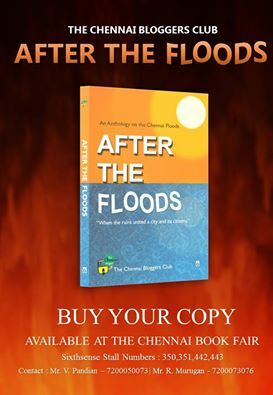 They are tied together by a few threads; the first being they are set in Chennai, this book was spurred by the Chennai floods and each of the authors had been affected by the flood in one way or the other, the majority of the authors are amateur bloggers and this is possibly their maiden published piece. - The wonderful art work, cover design and the design in the book which makes the book stand out. - The stories: some stood out, some breezed past, and some tugged at the heart. Some of the stories brought smiles, some trepidation, some even memories of the losses that were suffered, most of them brought pride in the spirit of Chennai, the spirit we gloriously celebrated when the city rose as one from the deluge to reach out to the other. - I really missed a group photo of the CBC that is the reason for this book. Maybe the names of the authors could have been sacrificed on the back cover for a great group photo? Should you get the book? P.S. Words cannot be enough to express the gratitude and appreciation that is due to the admins of CBC, Mahesh Lakshmanan, Sindhu JP and Bragadeesh Prasanna for getting the book out and the entire support team of CBC that backed them.